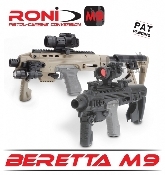 Convert your Beretta M9/92 to an accurate and lightweight carbine in seconds. Does not require the lower rail below the barrel. These may be order separately on the website. This product is regulated by NFA rules. Transfer of this product is regulated by NFA rules. This product converts a pistol into a short barreled rifle (SBR). SBR are regulated under the laws of the National Firearms Act of 1934 (NFA). It is illegal to possess this product unless it is registered with Bureau of Alcohol Tobacco Firearms and Explosives BATF&E (Form 1) or you are a Class 3 Dealer. It is illegal to transfer this product to anyone before they have registered this product with BATF&E.